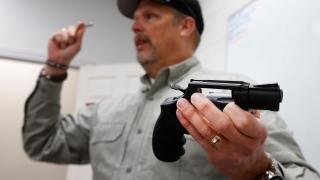 A gun instructor demonstrates a revolver as as he teaches a class. "I do not believe the continued wholesale allowance for each to possess a CCW license based on circumstances that may have existed 24 years ago is in the best interest of the public," Moore said. Deputy Carl Mandoyan is at the center of a legal dispute between the sheriff and the board of supervisors as to whether the sheriff can rehire him. The deputy was accused of domestic violence and accused of trying to break into his ex's apartment. He speaks for the first time about the shocking video with Eric Leonard on the NBC4 News at 6, Thursday, March 28, 2019. "The City should keep its word," said attorney Burt Jacobson, a former federal prosecutor and one of the plaintiffs in the case. "They wanted a settlement, and they wrote the settlement!” Jacobson said he’s faced recent threats as a result of court cases that ended many years ago. "Technology has improved tremendously in the last 24 years which has enabled individuals to instantly communicate with law enforcement via cellphones from anywhere and at any time should they feel threatened," Moore said.